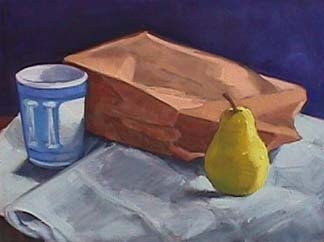 Kate Wattson Still Life Painting for Kids. BIDDINGTON'S Home & Search. 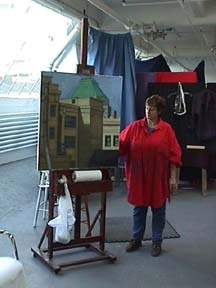 BIDDINGTON'S Creative Process--visits to artist's studios. My art is about finding beauty in everyday objects. I paint the things I see around my house or at my studio. 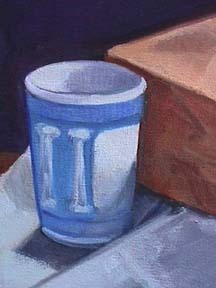 I liked the blue in this paper coffee cup. I liked the way the light came through this brown paper bag. I liked this pear. Well, it wasn't this exact pear. I ate that one. But I like pear color and pear shape. I made the cup simpler than it really looks. 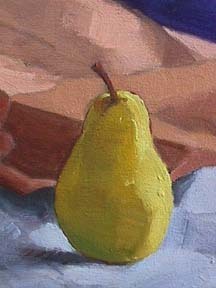 I painted the pear with a lot of detail and a lot of paint to make it really pop. 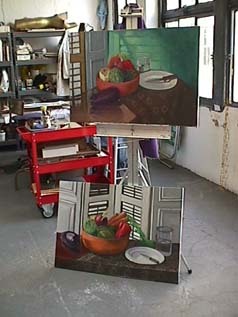 A painting like this one--made of up a group of objects--is called a "still life" or "nature morte". PROJECT IDEA: Why not try making your own still life painting using Kate Wattson's ideas and three things from your room? You can use crayons, paints, pastels or colored pencils. Who is Kate Wattson? Kate Wattson is an artist who lives in New York. She makes pictures in oil paints & in pastels and likes to paint still lifes, portraits and views from her studio windows in Dumbo (Brooklyn). Kate Wattson studied painting at the National Academy of Design. BIDDINGTON'S--Index to Our Content Articles.